Dr. Michael A. Gold received his medical degree from Jefferson Medical College and completed his residency in gynecology and obstetrics at Thomas Jefferson University Hospital. After residency, he completed his fellowship in gynecologic oncology at the OU Health Sciences Center in Oklahoma City, where he remained on the faculty for nine years. 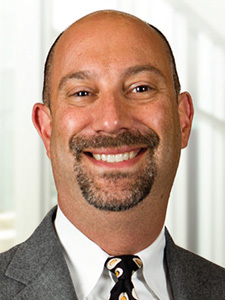 He then moved to Vanderbilt University Medical Center to serve as the Director of the Division of Gynecologic Oncology. Dr. Gold is a Clinical Associate Professor in the Department of Obstetrics and Gynecology at the OU School of Community Medicine. He is active in clinical research focusing on gynecologic cancers, specifically the imaging of cervical and uterine cancer. He is an active member of the Gynecologic Oncology Group, the Society of Gynecologic Oncologists, the American Society of Colposcopy and Cervical Pathology, and the American College of Radiology Imaging Network. Dr. Gold is certified by MD Anderson Cancer Network®, a program of MD Anderson Cancer Center.